I’m not quite sure at what point in time it was that the things I grew up with became retro. Perhaps it was around the same time I realised that I was now at that age I’d always considered to be ‘really old’ when I was child. I walked into a clothes shop the other day and felt like I’d walked back in time; it was full of all the 80s inspired clothes just like those I used to wear in my teens: the oversized t-shirts with retro logos and characters like mickey mouse; the beads, the denim jackets; the lycra – they were all there. Then there’s the music; I was watching the music channels on TV today and found myself in a time warp watching videos from Cyndi Lauper, The Human League, Jennifer Rush and eighties Madonna. I watched them with great fondness and tweeted that they made me want to dig out a ra-ra skirt and luminous socks. Ah, those were the days! 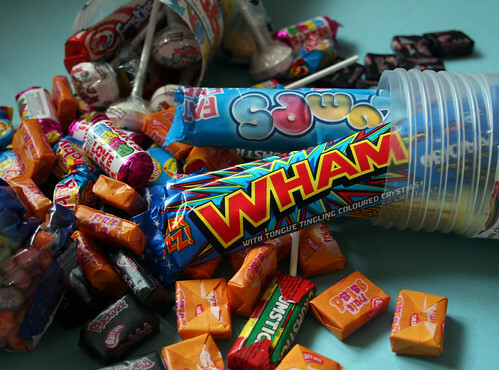 But one of the very best things that have come round again are the retro sweets I enjoyed as a child. At the canteen at work they’ve started selling little boxes full of milk bottles and alphabet sweets, sherbet fountains and packets of ‘Fizz Wizz’ – popping candy. They certainly cheer up the afternoon. 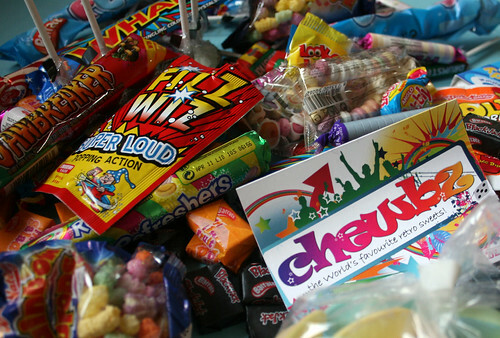 If you would also like to take a sugar rush back through time you don’t need to come to my workplace to do it; you can buy retro sweets on line from www.chewbz.com, an online company specialising in old fashioned sweets. When they saw my twittering about my delight at the sweets from the canteen they kindly sent me one of their ‘chewbz’; a big tube packed with all the old favourites. I found it impossible to choose my own favourite – I loved them all; the flying saucers; the sherbet dip; the candy watch; the parma violets. I was in heaven! As well as the chewbz you can also buy hampers, boxes and old fashioned jars of sweets. They’d make lovely gifts for any of your ‘really old’ friends who may enjoy some nostalgia. I just wouldn’t advocate telling them they’re in that category. Especially the ra-ra skirt and luminous socks! The music and sweets I’m good to enjoy, though! On the way back from lunch with some friends over the weekend, we stopped off at The Oldest Sweet Shop In England in Pateley Bridge in North Yorkshire, which is one of our favourite shops. It was packed full with people of every age waiting patiently in a queue to be served up quarters of loads of different types of sweets all laid out neatly in those plastic containers on shelves. It was heaven; I remember walking home from primary school in the 70s and I would have 5p to spend at the Dairy and would get about 15 sweets to chew on for the rest of the journey home. You can actually get their sweets online; just google “oldest sweet shop pateley”. Oh, yes! Walking home from school and getting sweets; what a memory! I also vividly remember coming home from secondary school on really hot days and going to the shop on the corner near the school and buying ice pops to help cool off. Bliss. The sweet shop sounds adorable. We’re still loving this lovely review Julia, especially the yummy pictures you took! If only we were all headed back to school this month eh? !